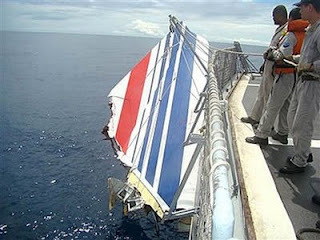 Update for 10 June 2009: The number of bodies recovered has increased to 41, and Brazilian authorities have begun the process of identifying bodies. The Brazilian Air Force has also incorporated the recommended change of the pitot system in the presidential aircraft, an A319. Air France has accelerated its effort to replace pitot tubes on its A330 and A340 Airbus fleet after members of one pilots union threatened to refuse to fly the unmodified airplanes. The airline also estimates that all the affected pitot tubes will be replaced by the end of July. 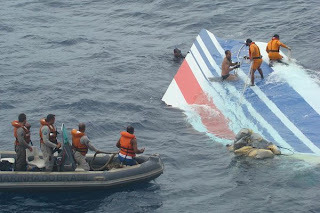 The vertical stabilizer is the largest piece of the aircraft that has been recovered. It shows no outward sign of fire or explosion, and a closer examination of the damage on that stabilizer will provide clues about whether it separated from the rest of the fuselage on impact with the water or while in flight. AirSafe.com will continue to provide updates to the accident investigation as more information becomes available. I have always considered Air France to maintain excellent mantenance standards, however Flight 447 is the SECOND major Air France incident where maintenance directives seem to have been ignored or at least have been slow to be acted upon. I am sure you are aware the investigation of the crash of the AF Concorde on take-off at CDG determined that recommended modifications to strengthen the under-side of the fuel tanks had never been carried out. On the otherhand British Airways had completed the modifications on their Concorde fleet. DOES AIR FRANCE HAVE A SERIOUS MAINTENANCE PROBLEM ?